SANTIAGO, Oct 4 2012 (IPS) - The announcement that the La Nación newspaper of Chile is closing down has drawn the attention of journalists, analysts and opposition lawmakers to the heavy concentration of press ownership, now in the hands of only two business groups, and to the lack of regulations to ensure media pluralism. “The state must create public media in areas (press, radio or television) where there is a high concentration of ownership,” said Marcelo Castillo, head of the Chilean Association of Journalists. Furthermore, “public communication policies are needed that go beyond the mere existence of media,” he said. At present, the only state electronic media outlet is National Television of Chile, an autonomous company with a seven-member board nominated by the president and ratified by the Senate. The closure of the century-old La Nación, in which the state owned a 69 percent share, was decided by board members representing the right-wing government of President Sebastián Piñera, who had announced he would make this decision if he were elected president. Late last year, La Nación’s print version was cancelled, and on Sept. 24 it was agreed that the online version, which receives one million hits, will be terminated. In addition to its impact on communications, the decision means 600 workers will left without a job. “For 20 years, since the return to democracy, La Nación has always been subordinated to the government of the day, and we believe this is not advisable and that the authorities do not need their own media,” said government spokesman Andrés Chadwick. Carlos Larraín, president of the National Renewal party, a member of the governing coalition, called the closure “very good news” and said that for the sake of journalism, it was good to end state competition against the free press. “A subsidised press is worthless,” he said. 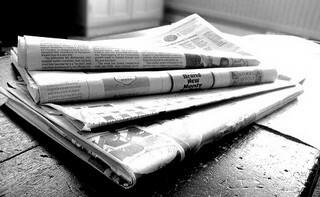 Figures from the National Press Association, the print media owners’ group, indicate that two companies concentrate 90 percent of Chilean readers. They are El Mercurio and the Consorcio Periodístico de Chile SA, which controls the newspapers La Tercera and La Cuarta and the magazine Qué Pasa, among other print and online media. Both firms are in the hands of the richest and most influential families in the country, who keep the right-wing ideology alive in the press. But Castillo pointed out that although Piñera had decreed the closing of La Nación, the previous governments of the centre-left Coalition for Democracy had failed to promote a public policy for the media. “During the last three years of the dictatorship of Augusto Pinochet (1973-1990) there was more pluralism in the press than there is now,” he said. “For instance, there is not a single opposition daily newspaper in Chile at present. Having a public policy for communications is not only the responsibility of the Piñera government, but of administrations from the end of the dictatorship onwards,” he said. Examples of newspapers that have fallen by the wayside include Fortín Mapocho, a daily that played a key role in the fight against the dictatorship, which went under in 1991, and the progressive newspaper La Época, which was published from 1987 to 1998. And weeklies like Análisis and Apsi, which closed in 1994 and 1995 respectively, were emblematic opponents of the dictatorship, but did not survive the return to democracy. In the view of sociologist Manuel Antonio Garretón, winner of the National Prize for Humanities and Social Sciences in 2007, the closure of La Nación shows “an ideological intent to dismantle public spaces like education, social security and now communication. “In the case of La Nación, the state has given up a potential public space which, since the market is not plural, it should guarantee,” he told IPS. “My understanding is that when the market cannot offer, as in this case, press pluralism, the state itself ought to offer it, to offset the ideologically right-wing private media,” he said. “The state should promote and permit the creation of media outlets with views different to those of the predominant media,” he said. In Garretón’s view, the dismantling began when the Chilean National Radio station was privatised in 1993, representing the loss of a major public awareness-raising instrument. “All forms of state provision that are participative in character, as they should be, are being eliminated,” he said. “The clearest example is education, but there are other fields like public television,” he said. He said the concentration of ownership “generates ideas and visions of a nation derived from a lack of real press freedom. “The problem is that the structure of advertising in our country has not been democratised. It is not that legislation has not been tried, but that the right does not want to democratise advertising in the media,” said the lawmaker. The state’s role is “not to subsidise, but to ensure a regulatory framework so that companies must place their advertising in a diversity of media outlets,” he said. “Democracy is not only about voting and electing, but also about economic democracy and circulating a diversity of opinions,” he argued.